This workshop is for 5 nights and 6 days. Your adventure begins with a welcome dinner at 6 p.m. on August 17 and ends after our breakfast on August 22. The workshop fee includes your cabin, catered food by a professional chef, two horseback rides and two guided hikes, photography instruction, and a pair of eclipse viewing glasses. The workshop fee does not include transportation to and from the ranch (we recommend a car with four-wheel drive), a la carte guided hiking, massages, alcohol and gratuities. J Bar L recommends flying into Idaho Falls (IDA) as the most convenient airport. From there it is about a 1 hour 45 minute drive to the ranch. The Bozeman Airport (BZN) would be a 3 1/2 hour drive, and Missoula (MSO), which offers the most variety of flights, is a 4 1/2 hour drive. This workshop is sold out. Perhaps you want to consider another workshop, or sign up for our email list for announcements for the 2018 season. Note: A 50 percent deposit is required for us to secure lodging, food and more for your visit. The remaining balance is due on June 18, 2017. Have you ever wanted to get away from it all and discover what the middle of nowhere looks like? Well, if you take Exit 0 in Montana and drive down the dirt road, it will lead you deep into the majestic Centennial Valley. You might feel like you have traveled back in time, as the hawks and eagles guide you past cows, horses and antelope, and perhaps even you’ll spot a fox or coyote along the way. Once you get settled into your cabin, take in the spectacular views of the Centennial Mountains to the southeast, and the rolling golden hills and Snowcrest Range to the north. The J Bar L Ranch has been a “get away from it all” retreat for many years. 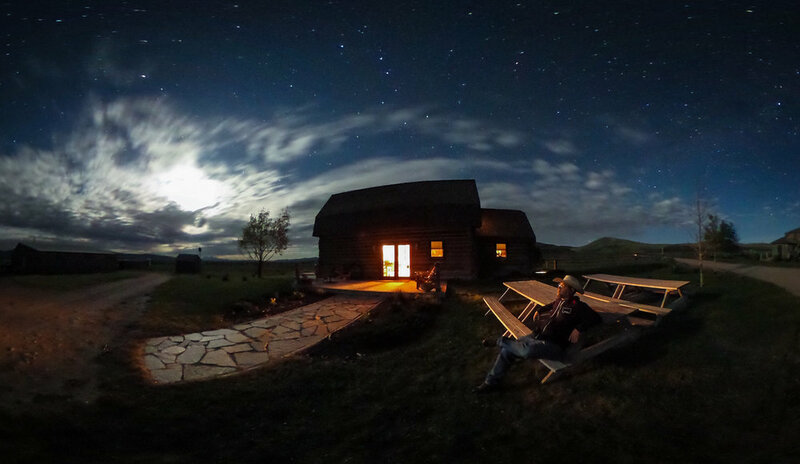 We are very excited to be working with them to offer you a rare experience to relax, unplug and really take in the grandeur from your fully restored homestead cabin. Feel free to wake up and enjoy the sunrise cut through the morning mist. Each day will be a new adventure to do things as a group, such as horseback riding or hiking, or you can just relax and experience the valley at your own pace. We will have scheduled meet-up times to go over your work, and will take plenty of photographs during the day and night. 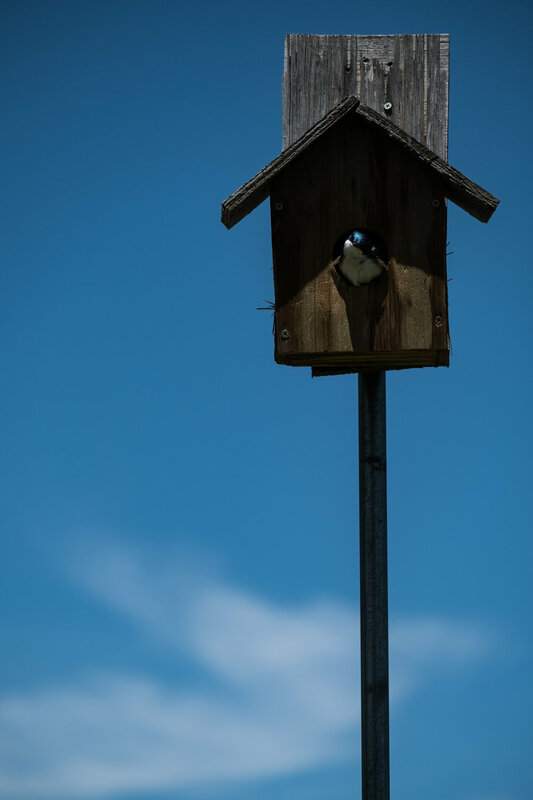 A certified massage therapist, fly-fishing, and a variety of bird and wildlife viewing are other activities you can enjoy. This is a very hands-on and small workshop limited to 6-10 people. The emphasis will be on honing your night photography skills and making you more comfortable with creating spectacular night photographs. We will scout on horse, foot or car during the day. You will have the opportunity to improve your landscape, wildlife and portrait photography, as well as to take your night photography to the next level. 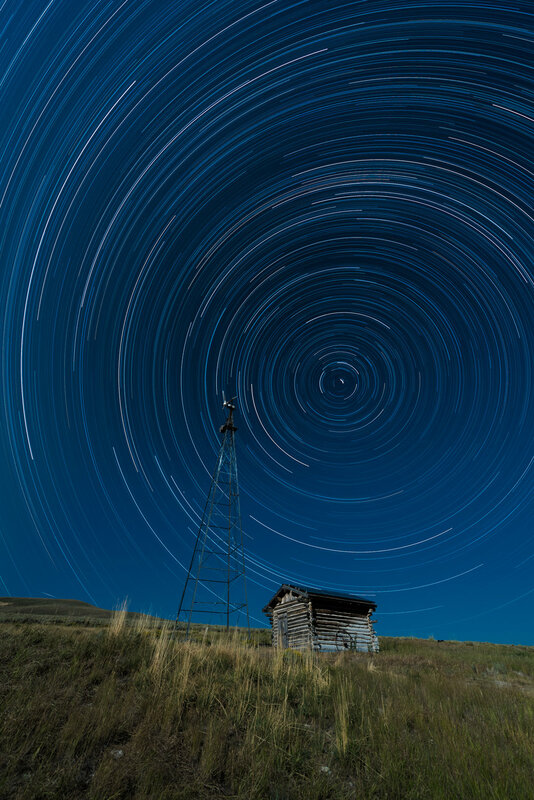 Star trails, star points and putting together awe-inspiring Milky Way panoramas are just the starting point. There will be little to no moon during our stay, so we will have plenty of stars and opportunities to paint with light. Every student will get an hour of one-on-one time with Gabriel to not only discuss their work at the ranch but to get feedback on their portfolio of images. Think full immersion … not only into the spectacular scenery that will surround us, but also eating, drinking and discussing photography all day and night. Did we mention that there is SOLAR ECLIPSE happening during the workshop? On August 21 from 10:15 a.m. to 11:57 a.m., the moon will start to overshadow the sun. Our location is very close to the totality zone (seeing the full eclipse of the sun). However, if we stay in the valley, with the eclipse happening over the Centennial Mountains, we will not see the totality. The totality is something incredible to witness and we will be waking up early (probably 5 a.m.) to drive 2 to 3 hours to set up as close to the blue line of totality as we can. We definitely are dependent on clear skies to experience this at its fullest, and will do our best to have several location options on our radar. Start of partial eclipse: August 21, 10:15 a.m.
End of partial eclipse: 11:57 a.m.
Late summer in Centennial Valley will most likely be warm (80s) during the day but will dip down into the 50s at night. Pack layers, along with a comfortable pair of shoes to hike around in. Cowboy hats and boots are not mandatory but highly recommended! There are few places in our world, let alone the United States, left to discover. You might feel a bit like Lewis and Clark did when they explored this area, but bear in mind that the road less traveled is not paved. Better to leave the wheels behind and make a new path through a field or down the river. When I first arrived at J Bar L Ranch, I had been traveling all day. I was exhausted and hungry. I was greeted with huge smiles and comfort food that washed away any lingering stress. I was all set to call it an early night and save my energy for the week, but the billions of stars were irresistible. So I grabbed my tripod and got to work. There is absolutely no light pollution in Centennial Valley. 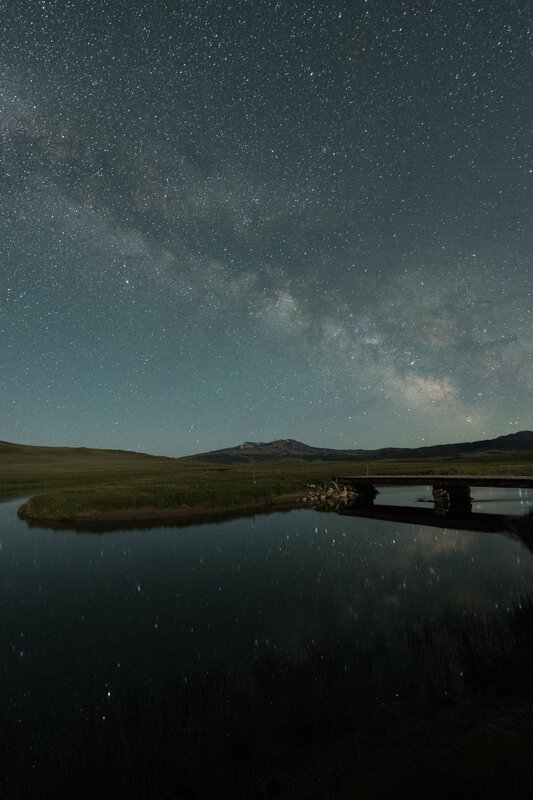 It was a new moon in June and the Milky Way was arcing perfectly over the Red Rock River. I quickly found a strategic spot to set up a panoramic shot and was ecstatic to have the stars reflect in the river perfectly. It was incredibly quiet except for the chirping crickets and occasional lowing of the cows. I had never seen the Milky Way stretch across the sky so vividly or felt so one with the universe. The next few days and nights were spent tuning my soul to this vastness. 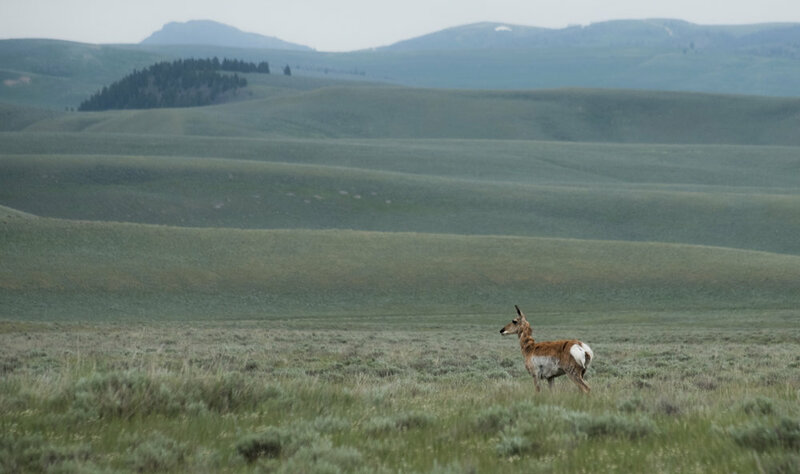 The landscape is incredibly expansive and I would spend hours just scanning the horizon for another animal or human that was sharing this space with me. Each night revealed a new exploration—stormy skies, abandoned buildings, cabins with one light left on—and those splendid mountains kept calling to my camera and I was surrounded by so much of so little. As a New Yorker, it was something I had never experienced before. I have since returned with a loved one to share this extraordinary place. The lush green hills had turned to gold. The hawks had overtaken the prairie dog population. And the people I had met only a few months before were like family. We witnessed meteors streaking across the sky and got up for one of the most beautiful sunrises I’ve ever seen—and heard. Less than 100 yards away, the cowboys were rounding up the herd and leading them to the next fertile field. The sun warmed the sky in brilliant colors of orange and red, and reflected onto the river, just as the stars had done hours before. I hope you can share this feeling, experience and adventure with us.